While exciting work is going with our contractors at the new facility, our dedicated ice team is working on the shutdown of the old facility. Andrew Nottingham, Andy Downs, Jim Sharpe, Greg Eigner and John Sherman were hard at work on Saturday Morning (4/20). First, they had to tear down the wall and open up a door. Still a bunch of water coming out from both above and below the liners. Note to self: Ensure we completely address the issue of water getting to the floor at the new facility. Then, they started with pumping the glycol out of the tubes into the barrels in which they came. This entailed a number of processed using a an compressor and some pumps. The good news was that the garage door still worked and the opener opened it all the way up. The bad news was that the cable broke, making closing a bit of a challenge. After a delay of a few days due to high winds, our partner Paint the Town Graphics was able to get the new sign put up in front of the new facility. We love the look of the new sign. How about you? For reference, the building in the background of the first picture is the ice rink where the club was founded 10 years ago. The building in the background of the second picture is the hotel we recommend people use for our spiels, the Townplace Suites by Marriott. The framing of the new facility is now complete. The wall between the warm room and the ice room is currently configured as one large window. Once we get it drywalled, we will check the wall strength to see if we need to add additional supports. The wall between the ice room and the icemaker's "man cave" is complete. One adjustment we made to this was to move the double doors 3.5 feet from the external wall. With this change, the icemakers will be able to drive the scraper straight off the ice into the rear room and place the scraper onto an ice pad that will be build against the far wall to keep the blade cool. Next step is the electrical rough in. The electrician has started that work this week. Work is finally beginning to start in earnest. The framing has begun! Rosema construction has begun the framing. They will be building the vestibule at the front door, the wall between the warm room and the ice room and the wall between the ice room and the ice maintenance room on the west side of the warehouse. When I arrived in the morning, they had just gotten started. The vestibule at the front door is to protect the broomstackers from the bone-chilling cold in mid-Winter when the door is opened. When complete, there will be a small heater that heats the vestibule. We have preserved the view onto the ice from the front door by having a large window directly across from the front door. They made great progress and by the end of the day, they had the vestibule fully framed. We have until the end of April to vacate our current facility and there is a lot of work to do. On Monday, April 8th we had a whole cadre of members (and friends/spouses & children) help us get the warm room (and some ice room) items moved to the new building. Preston Short, Marty Lemert, Geoff Randolph, Bobby Slocum, Mitch Kipfer (and daughter Lauren), Lynne Leckie, Bob Leckron, John Sherman, Sam Glassley (and his wife), Emily Marciniuk (and friend Wyatt), Andy Buuck, Shawn Wall, Gary Stoops, Matt Hart, Jeff Bockelman, Rob Binns, Tyler Shawgo, Karen Shawgo, Jerri Mead, Grayson Fischer and Craig Fischer all pitched in (and I might even have missed 1 or 2 people). Nearly 1/3 of the club turned out to help which is a great turnout. It is interesting to note that we had more people to help on this one evening than we had the entire time that we built the current facility. The design for the street sign has been finalized and the sign is now in production. One of the mistakes we made at our old facility was using the club logo on our sign. While the logo on our old sign had a curling stone on it, it wasn't very prominent. People driving by would have to read the sign, which didn't help to drive awareness. 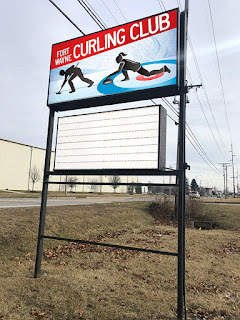 We are hopeful that the new sign will immediately make people thing of curling without having to read a word. It has the rings, a stone and a sweeper. We also wanted to show inclusion by having both a man and a woman on the sign. This sign checks all of the boxes for us. On Monday, March 18th we met with an engineering technician to map out what was needed for the electrical service upgrade. Currently we have single phase service going to the northeast corner of the warehouse. There are two meters. We believe one is for the warehouse and one is for the house (but we'll need to confirm this). If the upgraded service goes to this same location, we will have significant expense to run power to the southwest side of the building where the chiller will go. We were hoping, best case, to get service to the northwest corner of the building to reduce the distance we need to run wires (especially the larger more expensive wires that are needed for the 400 amp service). 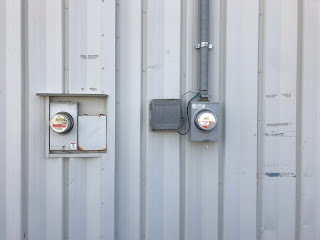 Essentially, the thinking was, bring 600 amp service to the northwest corner of the building, backfeed 200 amps to the existing box and run 400 amps to the chiller.